The famous "Countess of Stainlein, ex-Paganini of 1707" Stradivarius cello that was owned by the late Bernard Greenhouse has been sold at auction for more than $6 million to an anonymous patron of the arts in Montreal. 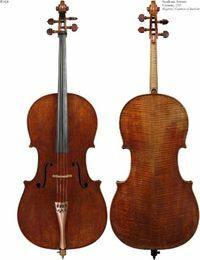 This auction most likely sets a new record for the sale of a cello, the previous record being about $5 million. The cello, which was made by Stradivarius during his prolific "golden period," has been played on by Bernard Greenhouse since the 1950's. Greenhouse passed away in May of 2011, and his family arranged to sell his cello via sealed auction through Reuning & Sons Violins in Boston. The "anonymous patron" plans to loan the cello to 18 year old Stéphane Tétreault, a student studying cello and conducting at the University of Montreal. The Countess of Stainlein cello was made by Stradivarius during his so-called "golden period," in 1707. The cello was crafted based on Stradivarius' revolutionary "forma B" pattern of cello construction that reduced the cello blueprint in size, making it more suitable for virtuoso solo performing. The Hills write regarding the genius of the forma B patterns that "they stand alone in representing exact dimensions necessary for the production of a standard of tone which combines the maximum power with the utmost refinement of quality, leaving nothing to be desired: bright, full and crisp, yet free from any suspicion of either nasal or metallic tendency." Stradivarius forma B cellos have been prized by some of the greatest soloists throughout history, including Yo Yo Ma, Jacqueline Du Pre, Gregor Piatagorsky, Rocco Fillipini, and Heinrich Schiff. The Countess Stainlein cello's path to Bernard Greenhouse can be traced back to 1816 and a cellist with the La Scala opera named Vincenzo Merighi, son of the Italian violin maker Antonio Merighi. (Another version of the cello's origins is a legend that it was discovered by Merighi, or someone else in Milan, in 1822 in a wheelbarrow on its way to the municipal dump.) 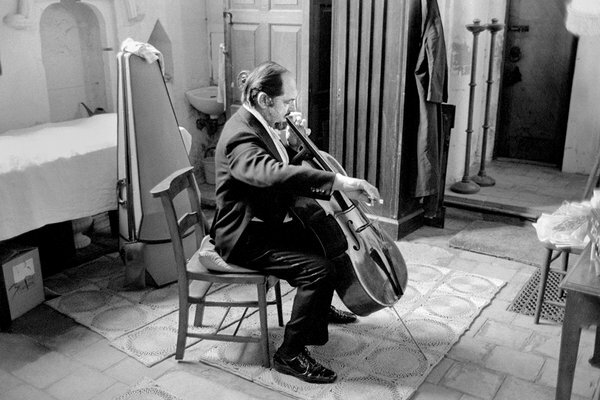 Vincenzo played on the cello throughout his distinguished career, eventually selling it to his associate Nicolo Paganini, the famous violin virtuoso. In his retirement Paganini worked to acquire a stock of rare instruments, and in 1839 he acquired the Countess of Stainlein from Merighi. Paganini's son Achille would play on the cello until 1854, when it was sold to Count Louis Stainlein through maker J.B. Vuillaume. The cello passed to the Count's widow, the Countess Stainlein, who allowed it to be examined and authenticated by Stradivarius expert Alfred Hill, where it was later featured in their definitive book on Stradivarius. From Countess Stainlein the cello would pass to celebrated German cellist Paul Grummer, who had a sucessful career as a performer, teacher, and composer. In 1938 Grummer sold the cello to Dr. George Talbot of Aachen, Germany, who was a fervent collector of fine stringed instruments. Dr. Talbot owned 5 Stradivarius violins, along with instruments by Pietro Guarneri and Giuseppe "Del Gesu" Guarneri. Bernard Greenhouse would purchase the cello from Dr. Talbot in 1957. Greenhouse wrote that "I had no doubt, no doubt at all that it was a Stradivarius; I didn't even look inside to find the label. The color of the varnish, the shape o the instrument, it was so beautiful, so very beautiful, and it seemed to me a great jewel." "The quality of sound is something that one wears, that adorns the individual as though it were a beautiful piece of apparel... With my Strad there was never a time when I was disappointed. No matter the weather or humidity, it stayed alive under my ear. There's a lusciousness about the sound. Under the ear it's a bit coarse, but this turns to velvet out in the hall, in the listener's ear. To the player, there's an ease of performance no modern instrument can equal; the changes in the color of sound cannot be equaled." Upon Bernard Greenhouse's death his family decided to auction the Countess Stainlein cello through the Boston maker Christopher Reuning. In an article for the New York Times, Elena Delbanco, daughter of Bernard Greenhouse, expressed her wish that the cello end up in the hands of a talented and deserving performer, rather than a museum vault or private collection. She is quoted as saying "what we're hoping for is a bid that also makes emotional sense," and it seems that the outcome, in which the cello is owned by a patron who is loaning it to a talented young cellist is exactly what the family was hoping for. It is a fitting tribute to Bernard Greenhouse that his beloved cello will continue to be used to create music, rather than languishing in a sealed collection. World class instruments like the Countess Stainlein Stradivarius were made to be played, and hopefully the Countess Stainlein will continue to find its way into the hands of committed musicians for many years to come. Nicholas Delbanco has written a wonderful book The Countess of Stanlein Restored, describing, with photographs, an extensive restoration that this cello underwent. In our research, we have found two spellings of the countess's name, both in very reliable sources. 'Stainlein' and 'Stanlein' seem to be both acceptable spellings. Cello Ensembles. There's Always Room for Cello.